The Feet of Silence the world’s best passive isolator? The Feet of Silence is our flagship isolator with extremely good isolation characteristics (freedom of movement) in all planes. The Feet of Silence system has been designed with the objective of affording today’s Audio systems the optimal working environment they need in order to deliver the realism and musicality which combine to make listening a truly High-End experience. Eperience shows that today’s Audio systems have been so highly developed that serious attention must be paid to the influence of external as well as internal vibrations and resonances. External vibrations are those which are spread through the walls and floors of the surrounding building and airborne vibrations. A list over the origins of these vibrations would be endless – but the worst offenders are road and rail traffic, machinery and loudspeakers. A large portion of these adulterating vibrations are generated by a manifold of sources that can neither be heard nor felt under normal circumstances. But all in all, the biggest miscreant is the feedback from the music itself. High amplitude, low frequency sounds from the loudspeakers cause the most protrusive of all disturbances, which quite simply bombard the entire system – both acoustically and through the mechanical coupling to the floor. Internal vibrations are those which stem from transformers, mechanical drive systems, as well as from electrical current flowing through cables and other components. 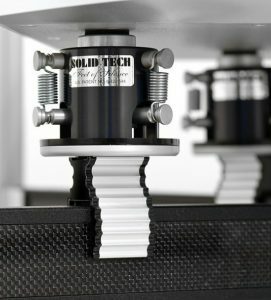 After scratching the surface of a problem as complex as vibration control, one can see that effective solutions are not simple, especially when one considers that not only must the problem of external influences be solved but that one must minimize the effect of a components self-generated vibrations and resonances. These vibrations and resonances will degrade the Audio capabilities as long as the equipment is not properly isolated and checked. Enter the Feet of Silence! Feet of Silence is a vibration control system which is particularly effective in isolating the components from horizontal as well as vertical vibrations evolving externally – plus subduing internal vibrations. The free placement possibilities mean that the resonances emitted from the component’s chassis can be tuned a more advantageous frequency. The Feet of Silence system consists of a cylindrically formed base, suspension attachments, the suspension itself and an inner -body with a damping layer for mechanical coupling to the components. The Base consists of a black anodized aluminum-cylinder with three mechanical rigidly mounted attachments for the suspension. The chosen material of aluminum and the cylindrical form contribute to a rigidity which reduces the amplitude of vibrations. The bottom of the base has three contact surfaces to achieve a rigid coupling to the supporting shelf. The Suspension consists of extension-springs of the highest industrial quality, guaranteed not to stretch over time. The suspension action and freedom of movement in both the vertical and horizontal planes provide an extremely effective isolation of the inner-body from externally generated vibrations. The Inner-Body, which is effectively isolated from external vibrations and its rigidity due to its small physical size means that it has great immunity against airborne vibrations compared, for example, to an isolated shelf unit or platform. The damping layer on top of the inner-body provide a scratch free mechanical coupling to the components plus subduing the extension-springs ringing properties. Pure technology – No voodoo. Correctly adapted and loaded is the resonance frequency well below 3Hz. Ensuring isolation even in the lowest and most degrading frequencies, resulting in much higher fidelity without tonal highlighting and masking such as more dynamic, cleaner transient response, wider and deeper soundstage, increased low level information, tighter bass and silkier highs.